As the company’s 50th anniversary approaches, Quiksilver is set to debut the new campaign ‘Stay High.’ Melbourne-based design studio, Urchin, and a handpicked team of leading creatives and artists including notable surfers Mikey Wright and Craig Anderson have been chosen to work on the campaign. Speaking on the future creative direction of Quiksilver, Global President, Pierre Agnes stated, “We want to live and document real travel stories and experiences from people within our brand, and in the process connect with local artists, musicians, designers, and grow our creative community. Collaborating, looking for positives and documenting this process allow us to respond and develop a unique visual language that’s raw, honest and undeniably Quiksilver. “Our lifestyle is about finding positives. Getting stoked. Keeping the high. During early 2016, Quiksilver will for the first time introduce the brand narrative ‘Stay High’, divided into two distinct stories: the AM and PM collection. Supported with strategic consumer segmentation and tiered product positioning targeting the lifestyle fashion market, the stories complete each other to create a cohesive line and will pay homage seasonally to a relevant destination. This season, the creative team immersed themselves in Rio de Janeiro and drew their inspiration from the unique culture of Brazil – from the brighter colors of São Conrado beach to the darker side of the Rocinha Favelas. The Surf Tripp AM collection is a daytime style inspired by iconic 80’s surf wear. This collection brings bright popping colors, loose brush work with irreverent humor, mixing up traditional surf fabrics like nylon, corduroy, terry toweling, flannels and knits into fashion forward combinations. The Dark Rituals PM collection represents street culture and nighttime styles with inspiration from tough, serious graphics from Quiksilver’s darker side of the 1990’s. 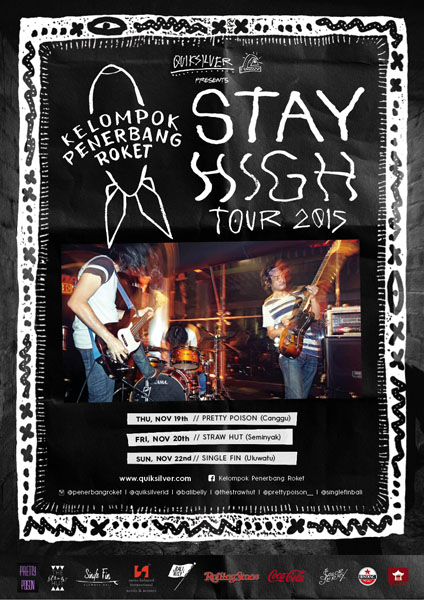 To launch the new “Stay High” campaign in Indonesia, Quiksilver will partner with the hottest rock n roll band in Indonesia at the moment – Kelompok Penerbang Roket (KPR), on a 3 stop tour of Bali.